Title: Magic User's Club! 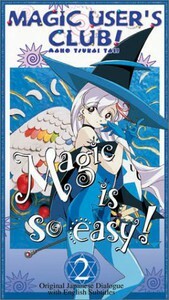 - Magic is so easy! The life of a normal high school student couldn't be complete without an army of shiny alien robots with inscrutable goals and unlimited firepower. Luckily, Earth has the Magic User's Club, ready to use their magic to benefit mankind. Unfortunately, magic may help against alien invaders, but it's not powerful enough to help Sae with homework and high school romance!